Whether you’re a webinar virgin or just ready to break up with your current provider, knowing how to choose the best webinar platform is a skill worth mastering. There are a lot of factors to consider, from all points of view; the presenter, audience, and marketing and sales team members who are involved will have different visions of what the ‘best’ actually looks like. So, as the final decision maker, what features and services should be non-negotiable when picking the best webinar platform for your business? We have narrowed it down to five essential factors to consider. With on-the-go business and lifestyles ever-growing, your webinar platform needs to be mobile-friendly or risk losing users who are away from their desk. Nowadays, any platform worth your time should have mobile accessibility. If you come across one that doesn’t, cross it off your potential list, immediately. How many attendees are you expecting to join the webinar? This is one of the first questions that needs answering before you can begin to seek out the best webinar platform for your requirements. It’s easy to both over and underestimate, so try to be realistic. You don’t want to either pay for a platform that accommodates 1000s of users when in reality there will be a smaller audience, or realise that you are running out of seats in the run up to the event. Once you have agreed on a sensible estimate, eliminate potential platforms based on whether they offer a package that fits your number. Even if you’re a dab hand at creating and hosting webinars, it’s good to know there is a support available. While most go without a hitch, there is a lot that could go wrong. Choosing a webinar platform whose team provides on call support is a must, and also look out for features like the knowledge centre that comes with our own solutions. This is packed with information to self-educate and train yourself, in addition to the option of chatting to our team directly for help. You can only reap the full benefits of your webinars if they’re fully integrated into your marketing and content strategy. That means being able to integrate your Marketing Automation and CRM tools is crucial to choosing the best webinar platform, such as MailChimp and Salesforce. Our own connects with Zapier, which allows you to extract information and add it to a huge list of SaaS tools at the click of the button. If you only take away one piece of advice from this blog post, let it be this: ask for a free trial! We are firm believers in trying before you buy, and a free trial is your chance to do that. 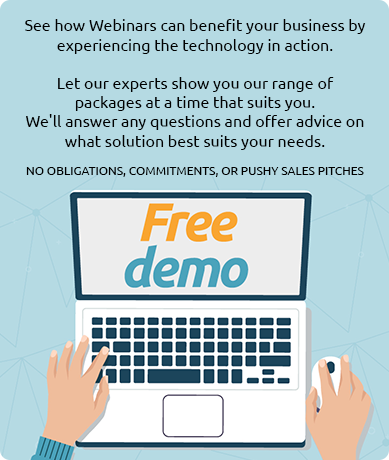 Even if the webinar platform you’re looking into ticks all the boxes that we’ve listed above, a free trial will allow you to see these features in action and judge the quality. Ours is a 30 day, full functionality, no strings attached trial, in case you were interested. Hopefully you feel more confident when it comes to choosing the best webinar platform now, and if you’re still unsure, we may as well plug our services not-so-subtly one last time. Read up on our FastCast solutions and drop us a message on Facebook or Twitter if you want to know more.